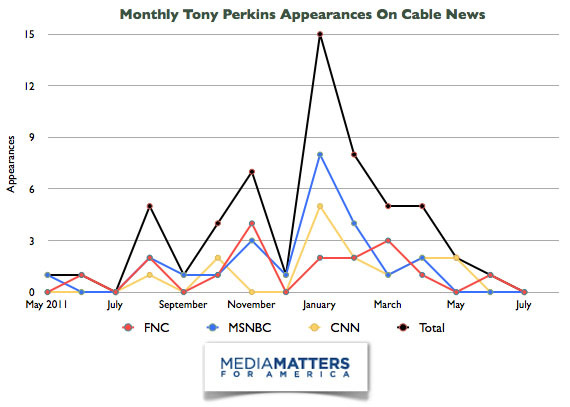 Family Research Council (FRC) president Tony Perkins has appeared significantly less frequently on CNN and MSNBC in the wake of petitions calling on the networks to stop hosting him. Perkins, whose organization has been labeled an anti-gay “hate group,” continues to appear frequently on Fox News. Equality Matters searched TV Eyes, LexisNexis, and the Family Research Council’s video archives for Fox News, CNN, and MSNBC between August 1, 2012 and July 28, 2014using the terms “Tony Perkins,” “Tony Perkins AND Family Research Council,” “Perkins AND Family Research Council,” and “Tony AND Family Research Council.” For data prior to August 2012, Equality Matters used data collected in an earlier Equality Matters item focusing on Perkins’ appearances during the Republican presidential primary season. Equality Matters considered Perkins’ appearances to be focused on LGBT topics if LGBT issues were either the sole focus of his interviews or were raised during segments that also covered other topics.